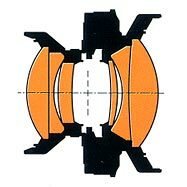 Professional cameras allow perspective corrections and deliberate inclinations of the plane of best sharpness ("Scheimpflug plane") which is not possible with fixed 35 mm or medium format cameras (or only with great restrictions). Rodenstock's range "Lenses for professional photography" therefore includes different lens types which are available in graduated focal lenght version to meet practical requirements. 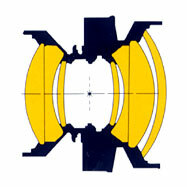 Besides mentioned shutter types you can request lenses in Horseman-ISS, Noble-Prestor and Copal-Press shutters. Other shutter types - on demand. 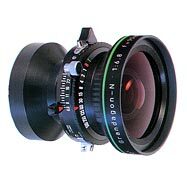 Apo-Sironar-N | The photographer's "workhorse"
The Apo-Sironar-N is the all-round lens for the professional photographer. Typical applications: product shots of every kind, industrial subjects, landscape and city photography. The six-element Apo-Sironar-N bears the "Apo" designation without restriction despite its very advatageous price. The field angle is 72 degree. The image circle diameter exceeds the diagonal of the recommended format by around 45%; this gives the photographer considerable edge quality together with abundant shift and swing possibilities. 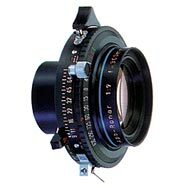 The Apo-Sironar-S is a lense for universal use which has been modified to provide the highest image reproduction quality. Its special stregths can be seen when complex, fine structures in the adjustment range have to be reproduced. Its field angle has been increased to 75 degrees and so permit even more generous shifts. 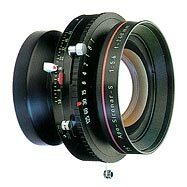 Therefore is the Apo-Sironar-S also the ideal standard lens for applications which require particulary large parallel shifts to correct the perspective. As a result of elimination of the secondary spectrum thanks to the use of ED glass materials with anomalous dispersion, no visible colour fringing occurs even at edges with extreme contrast. In addition, the light fall-off towards the edge has been reduced for a more uniform illumination. The Apo-Sironar-W with the field angle of 80 degrees allow to use all possible movements of your camera. 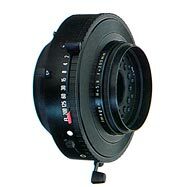 This universal lens can be used then converting your camera to larger formats. In the near area - at scales of around 1:1, the quality of leneses optimised for larger distances falls visibly from the usual stadard of performance. And it is here that the Macro-Sironar-N come into their own for imaging scales of 1:5 and greater. The Apo-Macro-sironar offers excellent imaging qulity in conjunction with the wide freedom of movement required for large-format photography. The Apo-Macro-Sironar provides exceptional results without any color fringes at a scale range from 1:5 to 2:1 without any need to adjust the scale individually. 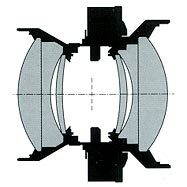 The focal lengths 0f 120 and 180 mm allow work with most cameras without any extra tube extension even at a scale of 2:1. 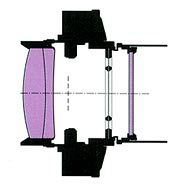 Roll film formats for large format requireshorter focal lenght lenses. With focal lenghts of 35, 45 and 55 mm, photography in close spaces on roll film or up to a format of 4x5" becomes "dymanic enjoyment". Both lenses give you the freedom to find new and appealing views in product photography. 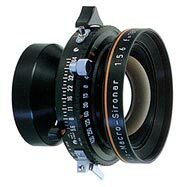 But new standards in freedom of movements are also offered by the the Apo-Grandagon super wide-angle lenses with a useful field angle of 120 degrees in architectural photography. With the Rodenstock Focus-Mount, both lenses can be fitted to cameras without bellows - a feature which makes large format photography mobile! The Grandagon-N with its field angle of up to 105 degrees can really display its strenghts in wide photos in close conditions, for example in architecture or industrial photography or in panorama views. The Grandagon-N is available in two versions: with the maximum aperture 4,5 in focal lenghts 65 to 90 mm it has 8 elements and with the maximum aperture 6,8 in focal lenght 75 to 155 it has 6 elements. 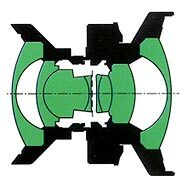 The eight element lenses offer not only a nigh maximum aperture, but also a field angle of 109 degrees, an even more uniform illumination and distorsion values of less than 1%. The use of neutral grey, vignetting-free Center Filters is recommended for critical motifs and to make best use of image circle. High-qulity leneses are normally expexted to yield sharp, crisp images. For some applications, however, - for example in prottrait shots - a softer luminous rendering is preferred over faithful detail sharpness. 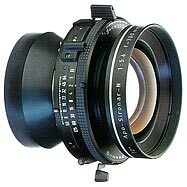 The Imagon lens with focal lenghts of 200 mm, 250 mm and 300 mm meets this need for film sizes up to 13x18 cm (5x7") in a very special way. It does not produce the blurred images typical for incorrect focusing or poor quality lenses. It rather overlays a clearly defined image core with delicate diffusion controlled by adjustable push-on perforated diaphragms. By spreading highlight outlines into the shadows, the Imagon softens the hard definition, yielding portrair or landscape effects that range from a slightly flattering rendering to dreamy, romantic moods. Strictly speaking, sharp focusing is only possible in the subject plane; in front of or behind this plane, the sharpness is less. The area in which unsharpness is not yet recognizable as such is called "depth of field". The longer the focal length of a lens, the shallower the depth of field; but the more the lens is stopped down, the larger this again becomes. 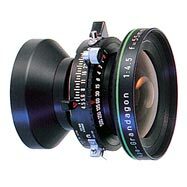 Because large taking formats require long focal lengths, large format lenses have to be stopped down quite a lot in order to provide sufficient depth of field. A certain amount of stopping down is also normally required to suppress the residual aberration which can never be corrected 100%. 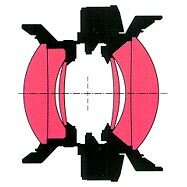 But at low apertures diffraction -an unavoidable physical effect -increases so that the sharpness is visibly reduced. For this reason, you should never stop down any more than is absolutely necessary. 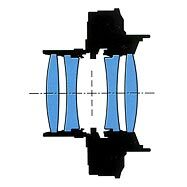 Under optimum circumstances most large format lenses should be stopped down to f/22; smaller apertures may be permissible with larger formats (see chart). If a great deal of depth of field is required, the aperture can be stopped down by one more number without any substantial loss in the image sharpness. When comparing different taking formats, the different focal lengths, the different depths of field and the different diffraction must be taken into contact if the comparison is to be correct. Because the different taking formats have different "width to height" ratios, the corresponding format diagonal is used as the reference value. The chart shows focal lengths (from super wide-angle to long focal length) which have corresponding diagonal field angles and which have been rounded to standard values in comparison with standard focal lengths for 35 mm photography. The last column shows the corresponding optimum aperture values with regard to depth of field and diffraction; the reference value here is aperture f/5.6 for 35 mm. These recommended values should only be exceeded in the interest of best possible sharpness when the depth of field is much more important than good sharpness. In order to make optimum use of the decisive advantage of a large format camera, i.e. its wide range of movements, you need lenses with a large image circle and first-class image reproduction quality right up to the edge of the image circle. The most important camera movement is the parallel adjustment to eliminate or reduce converging verticals. Especially for architectural photographs or product shots it may be necessary to reduce convergence considerably. 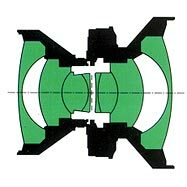 For this, the lens must have an image circle far beyond the size of the taking format. The following chart shows the recommended adjustments for a focusing distance of infinity and a working aperture of f/22. For shorter distances (e. g. for product shots), the image circle diameter will increase so that even larger adjustments are required.